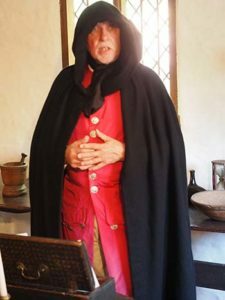 Bone-chilling, yet historically accurate, Webb-Deane-Stevens Museum’s Witches and Tombstones Tours will be held Saturday and Sunday, October 27 and 28. $18 per person. These 90-minute, timed tours leave every 45 minutes starting at 10 a.m. Advance tickets go on sale September 25 and may be purchased below. *Please note – Witches and Tombstones Tours include walking on uneven ground and the use of stairs and are not appropriate for children under 12. An up-close and creepy examination of all things funereal, Witches and Tombstones Tours begin in the museum’s Stevens House. Visitors step back in time and into the parlor set up for the wake of little Henry Stevens, who perished in 1828 at the age of three. 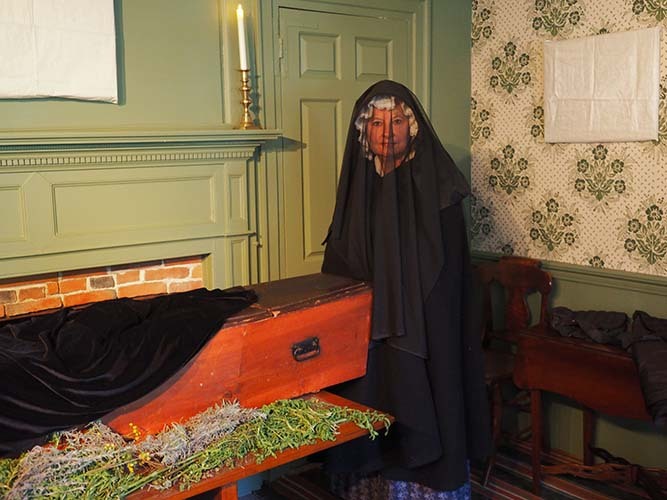 The tiny coffin is surrounded by tansy and rosemary, herbs used to mask any “odors.” The windows and mirrors are covered, and a small silhouette representing Henry is displayed. A silhouette would likely have been the only portrait the family would have to remember him by. A guide will detail 19th-century mourning practices, how illnesses were treated in the Stevens House, and how the living dealt with fears of being buried alive. The second stop on the tour is the Wethersfield Ancient Burying Ground. Visitors will view Henry Stevens’s tiny headstone and those of his father and mother, nearby. 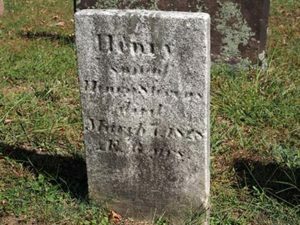 Among other gruesome particulars, visitors will view the grave of those who met their end during Connecticut’s first mass murder and see how gravestones warn the living of their own impending peril. The third stop is the circa 1714 Buttolph-Williams House, for tales from the notorious Wethersfield Witch Trials—which preceded the Salem Witch Trials by 30 years. The confession of witchcraft by Wethersfield resident Mary Johnson in 1648 was the first of 43 Connecticut cases, with 11 of them ending in execution. Katherine Harrison narrowly escaped the noose thanks to a technicality. Instead, she was banished and financially ruined. Located in the heart of Connecticut’s largest historic district, the Webb-Deane-Stevens Museum provides the quintessential New England experience – from the American Revolution to the early 20th century. Tours include the 1752 Joseph Webb House, where General George Washington met with French General Rochambeau and planned the military campaign leading to the end of the Revolutionary War, the 1770 Silas Deane House, built for America’s first diplomat to France, and the 1788 Isaac Stevens House, which depicts Connecticut life in the 18th and 19th centuries. For more information visit: www.webb-deane-stevens.org or call (860) 529-0612, and like us on Facebook: https://www.facebook.com/WDSMUSEUM. Notice: Your PayPal receipt is your ticket. Please bring a either a hard copy or electronic version to the event in case it is needed to confirm your purchase.